The horsepower presents the engine power, ability to perform work in a unit of time. The cubic centimetres signify the engine volume, i.e. the sum of the volumes of all cylinders. In simple terms, a vehicle gets the power (in horsepower) by combusting fuel and air in the cylinder (with volume in cc). Engine power is the basic measure of engine speed. This is one of the details on how the engine is released and at which speeds it releases the engine power (which is never the maximum speed the engine can achieve). We all talk about the power of an engine, and regularly mention the term horsepower. A “horsepower” or abbreviated KS is a physical force unit that has been replaced by the term “kilowatts” in the international system of units around 25 years ago and therefore, in the technical data of vehicles, the power of the propulsion engine is expressed precisely in kilowatts, although horsepower is much more entrenched and common. In order to describe the efforts of horses that have been used in the past for various jobs, the scientists have tried to describe the work (which the horse did), the time (which the horse spend doing the work), and the relation of these values. The result is what we all now call a “horse power”. According to this statement, the definition is now being held and it is said that KS=75kg*m/s. 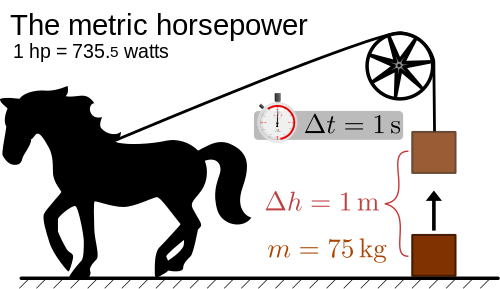 Further in a more comprehensible manner: an estimate of a horse (power of 1KS) is capable of subjecting 75kg of burden to 60 meters for 1 minute. More recently, by switching to the metric system, the power is expressed by watts (W) and kilowatts (kW). In this manner 1KS=0.735kW; or 1kW=1.35962KS. Engine displacement or cubic capacity is the basic data that each manufacturer first cites with the engine’s characteristics. In earlier engine development periods, the concept of a powerful engine was a much larger volume, which implies greater engine power and torque. In today’s time more attention is focused on the development of low-liter engines but with filling (turbo and compressor). The basic part of the engine is a cylinder, which in fact represents the engine working area. Therefore, in the technical data it is mentioned the “working volume” expressed in cubic centimeters or liters. Most of the engines have four, six or eight cylinders and the total engine volume represents the sum of the volume of all cylinders. For example, if we have a 2-liter four-cylinder engine (2000cc), this means every cylinder has a half liter capacity. The large engine volume was one of the easiest ways to increase power, and in the very beginning of motoring it was the only available way. Of course, larger volume means greater weight, consumption, and requires increased dimensions of the engine space, which negatively affects the aerodynamics, so that negativity in practice surpasses the positive side and – manufacturers prefer to resort to other ways of pulling extra power from the engine with some moderate displacement. Cubic capacity provides information about the size of the engine. It specifies how large and heavy the engine is, and additionally explains its dynamic response depending on the materials integrated in the moving parts. It can be said that it represents the pumping capacity of the engine. Horsepower gives information about the power of the vehicle (work done by the engine). It usually represents the peak power, and it is related to the maximum speed the vehicle can achieve. Cubic capacity is measured in cubic centimeters. 10000cc = 1 liter. Horsepower is measuring unit – easily converted to KW if needed (1KS=0.735kW). Displacement is measured (calculated) as the total volume of the chambers. The volume is gotten from the diameter of the cylinders (the bore), the distance the piston travels (stroke) as well as the number of cylinders of the engine. Horsepower is determined by multiplying the torque (measured with dynamometer) by the engine speed (measured with tachometer) and dividing by 5252 (radians per second). Horsepower depends on the engines’ design and tuning, engines’ capacity and size, type of the fuel that is used, number of valves, valves’ timing, the air changing method (natural, turbocharged, supercharged..), the fuel delivery method and so on. The cubic centimeters will depend on engines’ design, bore (diameter), number of chambers. Although there is no straightforward link between horsepower and cc we can say that 1Ks = 14-17cc. Furthermore, there is a general conviction higher engine displacement results in higher horsepower (not necessarily always true and without linear relationship). Through the horsepower measure, scientists showed the work that a horse had done and in what time. According to that belief, which we hold today, the definition is explained as 1 horsepower = 75kg*m/s. More recently, this measure has been replaced in watts (W) and kW. The conversion of these values is, 1 KS=0.735 kW, i.e. 1 kW=1.359 KS. Cubic centimeters show the engine displacement of an engine (size and weight). It is one of the most important engine characteristics equal to the total volume of the chambers. Emilija Angelovska. 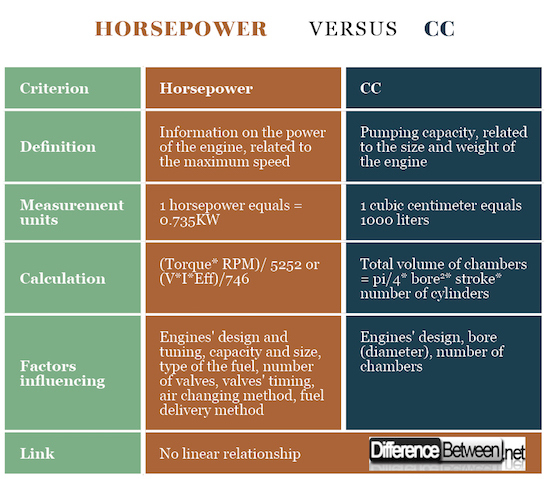 "Difference Between Horsepower and CC." DifferenceBetween.net. April 5, 2018 < http://www.differencebetween.net/science/difference-between-horsepower-and-cc/ >.